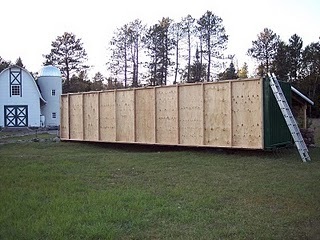 Shawn shows in some detail how he uses a large surplus metal shipping container for general storage space and as a mounting structure for a large solar heating system. This shows the collector bays mounted to the south side of the container. 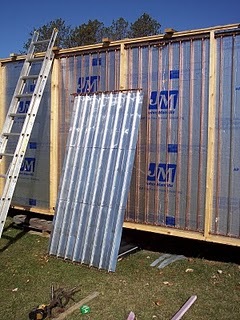 Shawn mounted a large 9 bay solar water heating solar collector mounted directly to the south wall of the container. Water is pumped through the collectors via an insulated buried pipeline that extends from the house to the container. The heated water will be used for space heating in the house. The homemade collector absorber plates being installed. The collectors are homemade. The collector absorbers use the copper tube and aluminum fin design that is used in our $1K solar system. This is a closed loop system with antifreeze for freeze protection. The system is nearly complete -- it will be interesting to see how it performs.